The evaluation involves analysis of the proportions of the face and teeth. 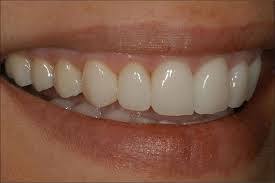 Teeth bare specific size relationships to other facial features and these relationships must be respected. Cosmetic dentistry is generally used to refer to any dental work that improves the appearance (though not necessarily the functionality) of teeth, gums and/or bite. It primarily focuses on improvement of dental aesthetics in color, position, shape, size, alignment and overall smile appearance. The main goal of cosmetic dentistry is to improve the appearance of your smile, which in turn enhances your overall appearance. Dr. Barry A. Kaplan, a Morristown premier cosmetic dentist, has been creating gorgeous, natural-looking smiles for more than 25 years. When it comes to cosmetic dentistry, Dr. Barry A. Kaplan is an artist. With his advanced education in cosmetic dentistry (prosthodontics) he is a specialist in performing all major cosmetic dentistry procedures. At his conveniently located dental office in Morristown, he makes use of the latest dental technology, always with the goal of giving his patients the highest quality care and the best, long lasting results. Dr. Kaplan views dental care as a lifelong commitment to your health, appearance and self-esteem and employs a variety of advanced techniques to perform amazing smile make-overs that transform your smile from self-conscious to self-confident! Dr. Kaplan works only with the finest, aesthetic materials and dental labs to create beautiful, natural looking restorations such as custom fit bridges, partials, dentures and highly-aesthetic all ceramic crowns. Or if your smile just needs a little brightening we offer a combination of professional in-office and take home whitening. 1. State-of-the-art Porcelain Veneers and Crowns correct gaps, stains and even poor alignment, so you can have the attractive, healthy look and smile you’ve always wanted. 2. Fixed Bridges are an option which can replace single or multiple teeth if there are teeth on either side of the missing tooth or teeth.. A bridge is a fixed solution that stays cemented in the mouth and does not come out. 3. Removable Partial Dentures can replace one or many missing teeth. this option is the most economical. A full denture can replace all missing teeth. 4. Complete Dentures are a removable solution which can replace all the missing teeth in an arch and adjacent tissues. 5. Bonding is a special filling that can restore, reshape and rejuvenate the teeth, improving both the function and the appearance of your smile. 6. Tooth-colored fillings can be used to replace old and worn silver amalgam, gold or other metal fillings for aesthetic purposes. 7. Dental Implant is a permanent artificial tooth root placed into your jaw where there are missing teeth. They look and feel like natural teeth and help prevent bone and gum damage caused by missing teeth. An implant is a solution that feels and acts the most like a natural tooth when chewing, brushing or smiling. Dental implants are the most comfortable, beautiful and cutting edge solution to the problem of missing teeth. They are the next best thing to real teeth. Whether it is a single tooth, several teeth, or all the upper and lower teeth that are missing, implants may be the best option for realizing a comfortably functioning smile again. 8. 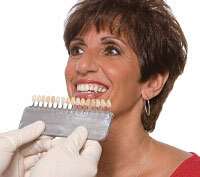 Teeth Whitening can whiten dark, yellow or permanently stained or discolored teeth. We offer a combination of professional in-office and take home whitening. When you visit our Morristown dental office, your comfort is our top priority. Dr. Kaplan is a dentist offering nitrous oxide, oral conscious sedation and IV sedation options. With sedation dentistry, even the most fearful patient can drift through treatment without anxiety. Dr. Barry A. Kaplan’s extensive training and specialization in Prosthodontics have given him the expertise to maintain a long standing reputation in Morristown, Mendham, and Randolph for delivering uncompromising care and exquisite results. Starting from the initial evaluation, we will always be available to make sure your experience with our office is an optimal one and look forward to exceeding your expectations. Ask us how we can help you start transforming and rejuvenating your smile today! Read our Patient Testimonials for Cosmetic Dentist in Morristown, Mendham, Randolph and the Surrounding Morris County Community, Dr. Barry Kaplan.